Former longtime University of Maine-Farmington coach and teacher Len MacPhee unveils the newly painted basketball court at Dearborn Gym that has been named Len MacPhee Court in his honor. A ceremony was held at the facility last Friday. 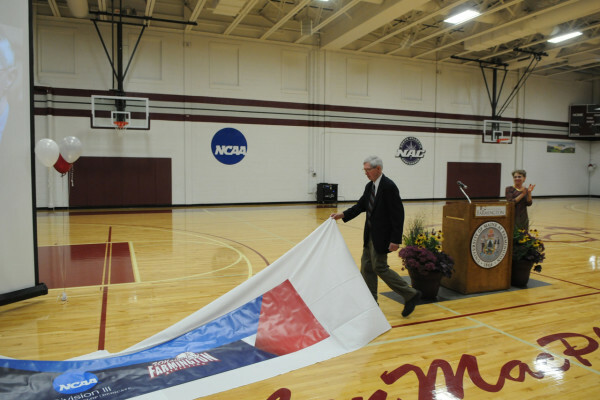 FARMINGTON, Maine — The University of Maine-Farmington athletic department on Friday dedicated its nearly renovated basketball court at Dearborn Gymnasium to legendary coach Len MacPhee. The event coincided with a campaign to raise funds for a dedicated auxiliary varsity weight room in the gym. MacPhee coached at the school for 36 years before retiring in June 2001. His tenure included 24 years of coaching men’s basketball, seven with women’s basketball, six with baseball and softball for three years. He also taught in the physical education department. MacPhee also served as the school’s athletic director, was chair of the Phys Ed program and director of the Coaching Certificate program. He also started the school’s Athletic Hall of Fame. Friends, family and alums of UMF basketball returned to Farmington for the well-attended event to honor the longtime coach. The guests included Charlotte Hornets head coach Steve Clifford. As a basketball coach, MacPhee earned numerous Coach of the Year awards with both teams and holds the record for most career wins in the men’s program with 322. The women’s program is most notable for its back-to-back appearances in the NAIA National Championship Tournament in 1995 and 1996. MacPhee is a member of the UMF Athletics Hall of Fame, the New England Basketball Hall of Fame and the Maine Basketball Hall of Fame. The University of Maine field hockey team moved up one spot to No. 19 in the most recent National Field Hockey Coaches Association poll released on Tuesday. Coach Josette Babineau’s Black Bears (6-2) beat Bryant University 2-0 on Friday, then dropped a 3-1 decision on Sunday in Orono to then-No. 3 North Carolina. UMaine returns to action with games Saturday at Northeastern and Sunday at Harvard.